Toyota, an industry leader in hybrid technology for two decades, is the only major automaker to lose ground on fuel economy in recent years. And with the Trump administration poised to roll back fuel efficiency standards, Toyota may face less pressure to pick up its pace. The Tundra also lags behind Detroit Three pickups—Dodge Ram, Ford F-150, and Chevy Silverado. The all-new 5.7L Dodge Ram pickup has improved its fuel economy by 4 mpg by incorporating mild hybrid technology and 2 mpg by using cutting-edge technologies like active aerodynamics. Ford has improved the F-150’s fuel economy, on average, by 2 mpg by reducing curb weight by 700 pounds, which customers have welcomed. One of Toyota’s best options may be to embrace hybridization for the Tundra, as it did for passenger cars at the beginning of the new millennium. A full hybrid system could improve the 5.7L V8 Tundra’s fuel economy to more than 25 mpg in real-world driving. This would surpass the Tundra’s 2025 fuel economy target without compromising drivability, horsepower, or torque and may allow Toyota to add new features valued by pickup buyers, like electrical outlets that could power a contractor’s power tools on the job site. A hybrid Tundra would also allow Toyota to bypass a host of other powertrain improvements, potentially avoiding some costs and complexity of adding multiple technologies. Combining a relatively simple hybrid powertrain with modern vehicle design could help satisfy the Tundra’s customer base while meeting fuel economy requirements for years to come. 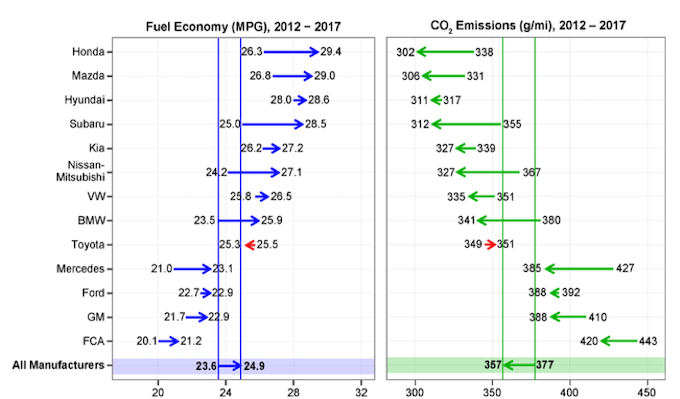 Yet if the Trump administration succeeds in rolling back fuel economy standards, Toyota and other manufacturers will have fewer incentives to push for higher-mpg fleets. Consumers will pay the price, refilling their cars more often and breathing dirtier air.